The BellaOnline Ebook Awards celebrate the rich diversity of self-published and small press ebooks. Some of the finest novels in our modern era began as self-published ebooks. Did you know that Ulysses by James Joyce was first self published? How about The Adventures of Peter Rabbit by Beatrix Potter and The Bridges of Madison County by Robert James Waller? Self-published authors deserve to be celebrated with the strongest accolades for their accomplishments. Many literature awards only accept paperback submissions or they only accept submissions from large publishers. A self-published author often can't even have the opportunity to apply for those awards. That seems a shame! Here at BellaOnline we feel the self-published and small-publisher books deserve immense recognition and promotion. Many times, smaller can definitely be better! Did you know that many of the major book award companies don't even read the entire book? Sometimes they might read only a page or two and decide your book is not in the running. What if the rest of the book was stunning? Not only that, but they don't offer any feedback at all on the book. You pay your fee, it goes into a black hole, and you get a rejection letter. End of story. At BellaOnline, we are strong supporters of the creative process. We want to help you succeed. So we absolutely will read your entire book if you submit it. Not only that, but if you want, we'll offer feedback based on what we read. You'll get supportive, constructive advice on how to polish your work into a top seller. Each category will have a Gold, Silver, and Bronze medalist. 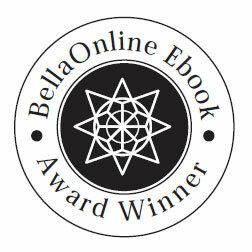 In addition, a Best of BellaOnline award will be given to the one book which rises above the rest. * Promotion in the Winter Solstice issue of MUSED. We would love to read your works, provide helpful feedback, and bring you the publicity you deserve! It all begins here!